What was the global impact of thalidomide? On September 24th, the Department of History, the Institute of Interdisciplinary Studies/Disability Studies, and the Institute of African Studies at Carleton University came together to host two speakers to Ottawa as part of a day-long meeting on the transnational history of the infamous drug thalidomide. 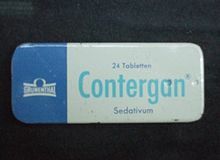 Developed by the German company Chemie Grünenthal GmbH, the drug was officially marketed from the mid-1950s to the early to mid-1960s under dozens of brand names. Dr. Susanne Klausen, medical historian and organizer of the event, pointed out in her introduction that thalidomide was a “drug in search of a disease.” However, while pharmaceuticals marketed the drug as a cure for many symptoms, it has gained its notorious reputation because of its use as a remedy for morning sickness in pregnant women. Although the drug was advertised as being “completely safe,” it caused severe birth defects – including deformed and/or absent organs, phocomelia, and several other life threatening deformities – in children whose pregnant mothers had taken the drug during the first trimester of pregnancy. Alexandra Niblock was the first speaker of the day. A thalidomider herself and holding an MA in Political Science from Simon Fraser University on the political economy of pharmaceutical companies, she spoke on the unique experience of Canadians affected by thalidomide. Entitled “The Hurdles of Federalism: the Canadian Experience of Thalidomide,” her talk offered the audience insight on the many ways the federal nature of Canada’s legal and social welfare systems had an impact on thalidomiders and their families. Considering thalidomide was withdrawn from the market in Germany months earlier, on November 25, 1961, it is in hindsight hard to understand how this drug remained on the Canadian market for so long. In her talk Niblock drew connections between federalism and the fact that thalidomide stayed on the Canadian market longer than elsewhere. Beyond such structural problems in recalling the drug, shockingly, pharmacists were reluctant to pull the drug off the market because it was such a popular product. The lack of media attention and support regarding the situation of Canadian thalidomiders, their families, and their efforts toward obtaining compensation contrasted sharply with the situation in Britain. There, the media championed thalidomide children and their families seeking compensation from the UK licensee of the drug. Niblock’s talk, based on personal memories and documents pertaining to her mother’s passionate struggle to make resources available for thalidomide-affected children in Western Canada, focused on the specific disadvantages thalidomiders had in obtaining financial settlements in Canada. Not only did they have to navigate discussions with the federal government, they also had to deal with one of the ten different provincial legislations because of the shared responsibility between the two levels of government in the health policy field. The requirements of two official languages and the absence of legislation allowing class action law suits further complicated the legal fights of thalidomide families’ efforts to obtain compensation from the relevant drug companies in Canada. Furthermore, the rehabilitation services that finally became available were based in only four centres located in Toronto, Montreal, Winnipeg, and Fredericton, and were tied to the acceptance of artificial limbs. Hers was a passionate talk about how Canadian thalidomiders themselves and their families struggled and fought for compensation. Next up was Dr. Julie Parle, (Honorary) Associate Professor in History at the School of Social Sciences of the University of KwaZulu-Natal and former President of the Southern African Historical Society, who spoke about the history of thalidomide in Africa. Beginning with a passionate statement of how she, a thalidomider herself, had never wanted to study thalidomide, she humorously thanked Dr. Klausen for managing to convince her to take on the topic for historical research over “a few bottles of red wine.” And if one thing became apparent that afternoon, it was that Dr. Parle does not do things half-heartedly. We can anticipate the publication of Dr. Parle and Dr. Klausen’s first article on thalidomide in Journal of Southern Africa Studies next year. Dr. Parle’s talk – “Dark Continent, Dark Remedy? Is There a History of Thalidomide in Africa?” – played off of the title of Dark Remedy: The Impact Of Thalidomide And Its Revival As A Vital Medicine, a 2001 book published by Trent Stephens and Rock Brynner. The talk questioned the assumption that no history exists of thalidomide in Africa. Focusing on South Africa, Dr. Parle’s area of academic specialization and her home, the talk asked: “Why was there no thalidomide epidemic in Africa during the 1960s?” In hearing the detailed report of her ongoing project, the audience witnessed Dr. Parle’s insightful and witty struggle with research questions and hypotheses. First, she demonstrated that looking for children born with phocomelia, the most visible consequence of the negligently marketed drug, may be the wrong approach as the drug was used for the treatment of many symptoms, not only nausea related to pregnancy. Drawing on advertisements, Dr. Parle showed that there could have easily been a market for thalidomide in South Africa and indeed the patent for the drug had been granted as early as 1957. Laughter erupted at the mention of the brand name “Oblivion-C”, advertised as a day-time sleeping aid that was sold in South Africa in the early 1960s by Westdene Products. This company was in fact an agent of the Swedish Astra International company who were also distributers of the prescription-free sedative Neurosedyn, which was a thalidomide-containing preparation. The transnational connections that Dr. Parle uncovered made her argument convincing that thalidomide could have found a market in South Africa. She moved on to consider both the growing local state control over pharmaceutical practices and testing, and the heroic tale of “the man who had a headache” as two possible explanations for the “lack” of a thalidomide epidemic in South Africa. Several scholars who attended the event, along with Dr. Julie Parle and Alexandra Niblock, Dr. Susanne Klausen, and myself, a PhD student in Carleton’s history department researching thalidomide in Ghana, seek to continue broadening the knowledge about thalidomide in the Canadian, African, and global contexts. In doing so, we hope to expand the historiography on thalidomide, which so far has been focused solely on the drug’s impact in the West. This is a task that has both academic as well as political value. Indeed, in her concluding words, Dr. Dominique Marshall, chair of Carleton University’s History department, encouraged all of those in attendance to consider endorsing the nomination of Dr. Frances Kelsey to the Historic Sites and Monuments Board of Canada for recognition as a historically significant person. Dr. Kelsey withstood great pressure to approve thalidomide for the American market and thus prevented the official sale of thalidomide in the United States. For those interested in learning more about the history of thalidomide, the 2014 BBC documentary Thalidomide: The Fifty Year Fight is freely available on YouTube. Many thanks to the sponsors of this event! Christine Chisholm is a PhD Student in the Department of History at Carleton University in Ottawa, Ontario. Roskies, Ethel. Abnormality and Normality: The Mothering of Thalidomide Children. Ithaca: Cornell University Press, 1972. Stephens, Trent, and Rock Brynner. Dark Remedy: The Impact Of Thalidomide And Its Revival As A Vital Medicine. 1st edition. New York: Basic Books, 2001. Sunday times, London. Suffer the Children: The Story of Thalidomide. London: Deutsch, 1979. Teff, Harvey. Thalidomide: The Legal Aftermath. Farnborough: Hants. Saxon House, 1976. The Thalidomide Children and the Law: A Report. London: Deutsch, 1973.